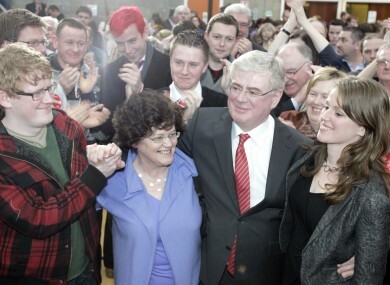 Eamon Gilmore celebrates his election in Dún Laoghaire with his family last year. If Dún Laoghaire loses another seat in the constituency commission, it could end up electing only two TDs next time. THE DÁIL CONSTITUENCY occasionally referred to as the “group of death” given the slew of high-profile candidates could be set to elect just two TDs in the next general election, according to a report this morning. The Irish Times says the report of the Constituency Commission, which is set to report its findings in the coming weeks, is to recommend cutting the number of members of the Dáil from the current 166 down to 158. While the most obvious seat losses could come in Tipperary, Donegal and Kerry – each of which is earmarked to see one five-seat constituency replacing the two current three-seaters – the report also suggests that Dublin constituencies could be consolidated. Among the possibilities mentioned are cutting one seat in Dún Laoghaire, reducing it from from seats to three – a move which would prove controversial within that constituency, which has recently lost one seat and is likely to see another one taken out of action next time. Dún Laoghaire was a five-seater until the election in February of last year, and was the subject of a special ‘group of death’ debate on RTÉ’s Frontline last February given the slew of high-profile candidates seeking election there. Three ministers – social protection minister Mary Hanafin, children’s minister Barry Andrews and planning minister Ciaran Cuffe – were among the five outgoing TDs last time looking to hang on to their seats as the area went from five seats to four. Among the other candidates were Labour leader Eamon Gilmore and the party’s Seanad chief Ivana Bacik, as well as stalwart Fine Gael TD Sean Barrett and PD-turned-FG councillor Mary Mitchell O’Connor, while the ULA’s Richard Boyd Barrett was also on the ballot. Ultimately the constituency was among those which saw the largest transformation during last year’s tumultuous election, with all three of the sitting ministers turfed out as the electorate punished Fianna Fáil and the Greens. The likes of Hanafin and Bacik – and potentially also Cuffe and Andrews – could be interested have another crack at election, providing an unusually heavyweight panel of challengers to the incumbent four. While this challenge could be made significantly more difficult if the number of seats is reduced to three, Fine Gael already has a trump card in this constituency – thanks to Seán Barrett’s automatic entitlement to re-election if he seeks it. Barrett is the Dáíl’s current Ceann Comhairle – meaning if he wants to be part of the 32nd Dáil, whenever it’s elected, he simply only has to say the word and he is automatically returned without needing to go before the public again. This is a legal privilege granted to the Ceann Comhairle in order to compensate them for the fact that their political neutrality, as an impartial overseer of Dáil business, means they are unable to engage in the cut and thrust of everyday politics. If the current Dáil runs to its full term and defers the next election to February 2016, Barrett will be 71, and may opt to bring an end to a 35-year career as a TD – but if he opts to keep going, he would automatically take one of the three available seats. This would mean that the crop of Bacik, Hanafin, Andrews and Cuffe and the usual handful of independent TDs – would have to overcome party conventions and an election in order to win back their Dáil seats against the incumbents, including a sitting Tánaiste. Email “Could Dún Laoghaire elect only two TDs at the next election?”. Feedback on “Could Dún Laoghaire elect only two TDs at the next election?”.